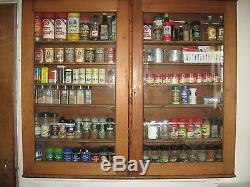 OFFERED TODAY, WE HAVE AN ANTIQUE APOTHECARY CABINET. IT IS IN VERY NICE ORIGINAL CONDITION. 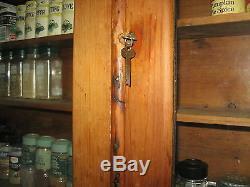 FEATURES DOUBLE DOORS WITH GLASS, 6 SHELVES AND THE ORIGINAL LOCK AND KEY. THIS CAN BE USED FOR MANY DIFFERENT THINGS. 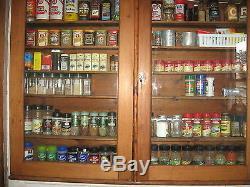 WE HAVE USED IT AS A SPICE RACK, BUT COULD BE USED TO SAFELY DISPLAY ANY OF YOUR TREASURES. IT MEASURES ABOUT 45" WIDE, 37 1/2" HIGH AND JUST UNDER 6 DEEP. HAS 2 ORIGINAL HANGERS ON THE BACK TO MOUNT TO YOUR WALL. USED IN A PHARMACY TO HOLD MEDICINAL ITEMS. FEEL FREE TO ASK ANY QUESTIONS. ALSO LISTED LOCALLY SO ITEM MAY END AT ANY TIME. The item "ANTIQUE APOTHECARY CABINET" is in sale since Thursday, May 05, 2016. This item is in the category "Antiques\Furniture\Cabinets & Cupboards\1900-1950". The seller is "jasperejones8u2u" and is located in Beaumont, California. This item can't be shipped, the buyer must pick up the item.